If you are in any kind of business in China and you are not linked in some way to the internet, you will become a penny business dinosaur. By this I mean you cannot grow at the speed and profit that an e-commerce business can grow. I found it difficult to get online with my phone in China. Nothing works there, and for security reasons, you can no longer buy SIM cards in the street as in the past. Although I was unable to Whatsapp, Tweet or receive emails (it was a pleasant trip for that peace alone!) for almost a week, I was able to receive my private emails in the hotel. When I turned my phone on in Heathrow, I had some 998 emails which I had been cc’d into in my inbox from my business, my charity and my design practice. In China everyone connects on WeChat; this app does everything – from email and text, to making payments. Whilst there I was told that when you leave the house now, you only need your phone as you pay for everything with one device. I saw the speed, safety and convenience of this and I recognised also that this platform has ambitions to develop outside of China – but it will also hold all the data and information of each individual – and that is quite a scary thought. Young people are so aware of this, they often tell me that they withdraw cash rather than pay on credit cards so nobody can see where they go or what they buy or do – the division is fascinating. We didn’t know the area, so we chose Trip Advisor as our guide (well, Lavinia did) and went along to check out this traditional art house hotel with all its history, tradition and a cool top floor restaurant overlooking the Bund. The building reminded me of Liberty in London, it has an old world grace and charm to it, but was completely up to date with the art and furnishings that the design team had carefully paired and complimented with style. Again, art has an enormous lease of life in China as a new wealth generation can invest in things that pleases and inspires. Art choice is not right or wrong, it is simply personally very appealing. It can also be a transportable investment. As young artists develop in popularity and experience, like all artists, the price (and investment) will increase and so savvy purchasers are vamping up their very neutral beige homes with vibrant art. It feels as an outsider looking at this new found investor’s baby, that from the explosion of colour and zeal for life in the art itself, that a fresh and exciting time lies ahead. It is here that you will notice the two layers of China; the old, traditional, hard-working and poor China side-by-side with new wealth – and it is extreme wealth. People live in very run-down houses and huts, held together with plastic sheeting and bits of rotten wood. They ride their bicycles or deliver packages from heavily laden electric scooters (as almost all transport is electric, the roads are busy but very quiet – the silence is quite eerie). You must buy your license plate (your tax) separately from the vehicle and electric vehicles come with free of charge license plates; petrol cars have a license which is sometimes as expensive as the vehicle itself. The wealth of the new generation, its technical speed and advancement has taken China ahead at lightening speed, but it has not forgotten its past or its people and there is a two-tier society living comfortably side-by-side as it competes in a world market. The food. I had such mixed reviews from ‘it’s the best’ to ‘it’s not great’ which I suppose is exactly what makes us all different. The food was not like the local Chinese food that we have in the West at all but it is similar; I think I was actually expecting that, but I wasn’t expecting it to be as healthy as it was! I understand now that what we eat and call Chinese food is in fact smothered in preservatives and colourings throughout Europe, but in Shanghai the food was constantly referencing digestion, vitality, bone density etc. I realised that they are a very healthy race. They cycle and they walk but they do not dress up. It is probably the most casual nation I have ever visited. All the clothes are casual. I could definitely see the influence of speed and comfort effecting fashion trends! Shopping. 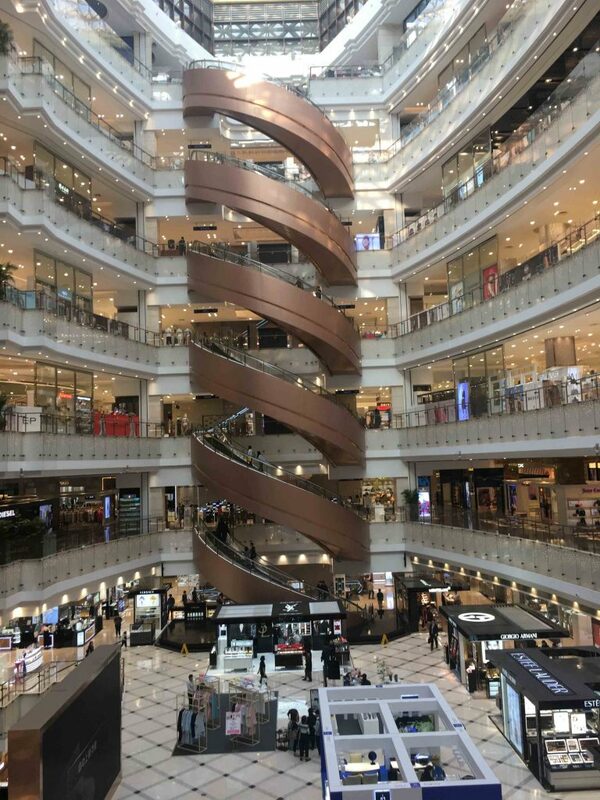 Well, I was in Shanghai for a week and I had just one slot without meetings, on Saturday afternoon after a morning TV news interview at the Penthouse of Design Chain’s offices where we discussed e-commerce, design and art. I had the rest of the day off, I took myself to the Technology Museum which is purpose built what the Chinese government promote as ‘the single road to the future’, so I wanted to see what all the talk about technology was about. It was an amazing building. 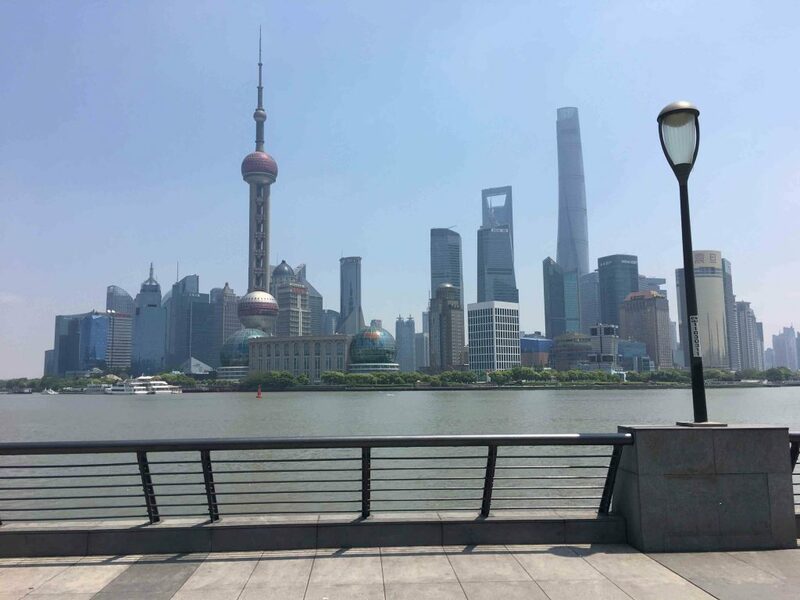 In terms of architecture, Shanghai is jaw dropping. The Wanda Reign hotel sits at the mouth of the Bund (the bund is what in Bournemouth we would call the bay; the enclave that wraps around the mainland). The Wanda Reign sits on the BFC – that’s short for the Business Finance Centre and it was designed by Norman Foster Architects. It is a fantastic landmark. It is just the beginning and as you travel along the Bund you see from Customs House, the old colonial buildings and the new skyscrapers sitting comfortably juxtaposing each other. They are dressed daily with brides who come to stand in front of the river in their bridal dresses with their photographers but what I found interesting as the rows and rows of brides went on was that they were often without a Groom and wore their trainers and their running pants beneath it – the one day you can look like a Princess and that practicality for comfort was still evident. Chinese men like petite woman and so Lavinia and I were like something fallen from Guliver’s Travels. Next Next post: China Fakes – We Found Them!